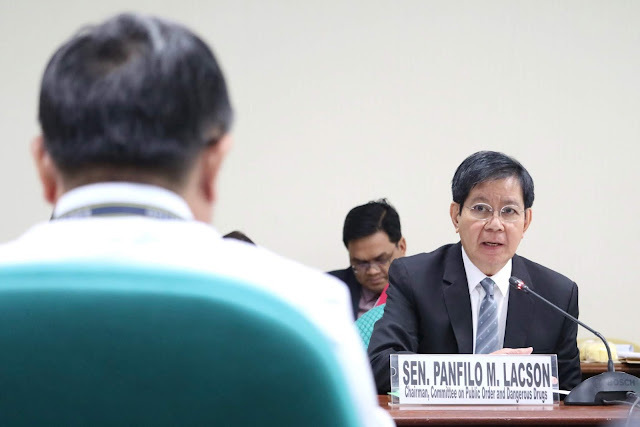 MANILA -- Senator Panfilo Lacson on Monday said the meeting between representatives from both chambers of Congress yielded "some progress" in a bid to break the ongoing impasse on the proposed 2019 national budget. "Some progress. We're still working on it. (We) will meet again tomorrow (Tuesday). Hopefully we can follow through and finalize tomorrow," Lacson said after the meeting concluded at the Senate. The Senate contingent was composed of Senators Lacson, Loren Legarda and Gregorio Honasan II, while the House panel was composed of Camarines Sur Rep. Rolando Andaya Jr., Albay Rep. Edcel Lagman, and San Juan Rep. Ronaldo Zamora. Both sides emerged sounding positive that the budget impasse would soon come to an end. Andaya said both panels were able to explain their sides and iron out the issues during their meeting. "We had a very lively conversation. We were able to explain both our sides in a very conducive manner for understanding. At hopefully, sana tomorrow (And hopefully, by tomorrow), we will come to an agreement," Andaya said. Andaya said he expects a new budget to be transmitted for President Rodrigo Duterte's signature by Friday. "May punto sila, may punto rin naman kami at bottom line, we wanted a new budget. Tama 'yung sabi ng ating Pangulo na get ourselves comfortable first mag-usap kayo (Both points were made and the bottom line is we wanted a new budget. The President is right in saying to get ourselves comfortable first, to talk things through)," Andaya said. Andaya reiterated that the House did not introduce amendments in the ratified version of the budget bill, noting that they merely itemized the lump sum appropriations. Lagman, meanwhile, said as long as both panels are communicating then "there's light at the end of the tunnel." "Hopefully by tomorrow night we could resolve the impasse... We are still talking but I am hopeful that there is light at the end of the tunnel," Lagman said.